Murdered by criminals, Detective Yokoda's body is retrieved by Professor Tani and taken to his laboratory. 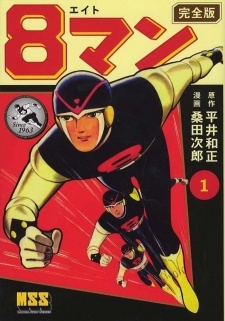 There, Tani performs an experiment that has failed seven times; Yokoda is the latest subject to have his life force transferred into an android body. For the first time, the experiment succeeds. Yokoda is reborn as the armor-skinned android 8 Man, able to dash at impossible speeds, as well as shape-shift into other people. He shifts himself into Yokoda, this time christening himself as "Hachiro Azuma". He keeps this identity a secret, known only to Tani and his police boss Chief Tanaka. Even his girlfriend Sachiko and friend Ichiro do not know he is an android. As 8-Man, Hachiro fights crime (even bringing his murderers to justice).